People are often curious about what causes alcoholism or alcohol problems. We don’t really use the term alcoholism anymore. 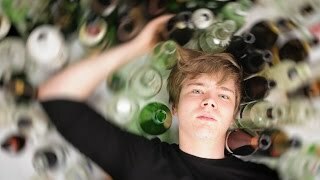 We use the term, alcohol use disorder but people often want to know why does one person fall into trouble with alcohol and the next person doesn’t. And you see this a lot when you look at young people who start out in college and often, and I deal with a lot of young people in my practice, young adults who start coming to me when they’re in college and you see, they often come to me and say, “Doctor, I’m not doing anything different than my friends are doing.” And often, they’re not because often kids in colleges will drink, over drink. There’s big parties. They go to big parties. They get drunk. It’s really kind of the expected. It is a social norm but then what happens is that as people get older, those social norms change and getting wasted every weekend is not in the social context anymore and often the kids who were just the normal binge drinkers if you will at college, they’re the ones who don’t change and they continue that same pattern afterwards. And those are the people who really, if you intervene early, they don’t have to keep going and get into deep deep trouble with alcohol. So what are the causes of alcoholism or alcohol problems? There can be different causes. There are some, you can really see where alcoholism runs in families. The reason it runs in families, there can be more than one reason. One is that there is a genetic predisposition in families to alcohol problems. We know now that there is an alcohol gene that can cause problems for people. Again, you may have the gene just like you may have the gene for other disorders, medical disorders. That doesn’t mean the switch is going to get flipped. It may, you see that in a family, there’s five siblings and two end up having alcohol problems and three don’t and those three, doesn’t mean that they don’t drink. For whatever reason, that genetic switch may not have been switched for them but it was for the other two. But the other thing may just be social norms where you often see families where no one else is an alcoholic except this one person who becomes really addicted to alcohol or other substances. Why does that happen? Well, that could be many reasons. That often can be peer driven. Again, there are social contexts where you see an older child who is very successful academically and a younger one who you see “falls in with the wrong crowd.” Again, they may start at a very young age drinking and it progresses and we do know alcohol problem, when you have an alcohol problem, if it’s not attended to, it is a progressive disorder, meaning it gets worse over time unless people really pay attention to it and start intervening. So those are some causes of alcohol problems.